Who doesn't love retro arcade games? There's nothing quite like cracking open an ice-cold Pepsi, squaring up to an arcade console, and hearing the initial musical sequence to your favorite game. Ion Audio's $100 iCade and Discovery Bay Game's $60 Atari Arcade for the iPad and iPad 2 aim to give you all the joy of a three-hour Breakout session without the leg and neck exhaustion, quarter depletion, and angry looks from the other kids waiting their turn. We went hands-on with these two accessories to see which one got the high score. When your iCade arrives, the first game you have to play is “Bjorn the Builder.” OK, so that’s not a real game. It’s just what I call building IKEA-esque furniture—some assembly is required. The iCade is made of several pieces of the world’s finest particleboard and—like all IKEA furniture I have put together—I managed to put in a major piece upside-down. Last time, it was two shelves in a bookcase, this time it was the lid/instruction panel to the iCade. That mistake fixed, it was time to play. 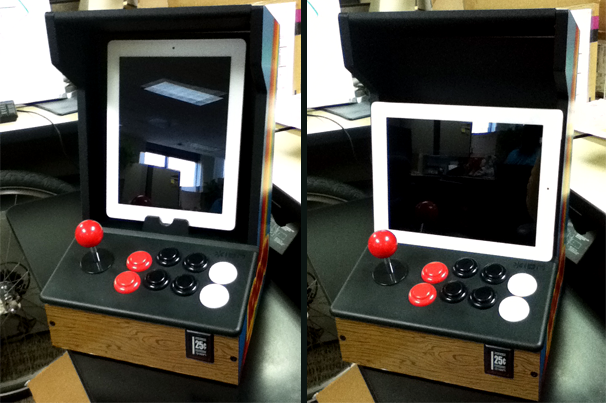 While an iPad fits nicely inside the iCade's frame in portrait orientation, it rests in front in landscape mode. When playing portrait-orientation games, the iPad fits into a small cradle in the "screen" area of the iCade, but when you need to use landscape orientation, you have to pull out the iPad and set it on a ledge just in front of that cradle area, making landscape gaming feel like an afterthought. If the iCade was about an inch wider, the iPad could fit horizontally inside of the cradle area, but it’s not, so you just have to deal with the awkwardness. The iCade doesn't work with all games—games have to be specifically designed to use keyboard control, as the iCade pairs with the iPad as a Bluetooth keyboard. All of the games in the Atari's Greatest Hits app are compatible with the iCade. (You can purchase all 100 of those games as a $15 in-app purchase.) And as cool as it is to play Asteroids and Missile Command in your iCade, you don’t have to play exclusively with Atari games, as a growing number of additional games are iCade-compatible. Think Geek notes that Silverfish Max, Super Mega Worm, Sideways Racing, Mos Speedrun, IronStar Arena, Compression HD, and HungryMaster all work with the iCade. Much to my delight, the iCade works with my newest obsession—Baby Monkey (Going Backwards on a Pig). The iCade provides has one joystick (on the left) and eight buttons (on the right) for game play. While the controls vary for each game, the iCade's joystick and buttons are very responsive. Indeed, while you can play the games using onscreen gestures, the iCade makes them much more playable and enjoyable. A big problem with the iCade is that it has no power switch, instead automatically turning off after a few minutes of inactivity (and turning on again when any control is touched). But the iCade apparently still draws battery power when "off," as after a few weeks of non-use, the two AA batteries became completely drained. The iCade can be powered from an AC adapter, but you must purchase that adapter separately. In a perfect world, the iCade housing would securely hold an iPad in landscape orientation, a power adapter would be included, and the Atari Greatest Hits bundle would be included with your $100 purchase. But if you’re an old-school gaming enthusiast who can afford it, the iCade is a great iPad companion. In our review of the Atari's Greatest Hits app, we noted that although it’s nice to see old-school games on the iPad, trying to play them without a joystick is extremely difficult. The Atari Arcade ( ) is an easy solution. For $60, you get an iPad stand—emblazoned, it just so happens, with a large Atari Logo—that sports an old-school, ball-topped joystick, as well as four buttons. Unlike the iCade, the Atari Arcade connects to your iPad via its 30-pin dock-connector port—the dock connector is located in the Atari Arcade's cradle—and gets its power directly from the iPad. (Alas, it can't charge your iPad.) The Atari Arcade also doesn't require DIY assembly. This means that to start playing, you just put your iPad in the cradle and press "Start." On the other hand, the big drawback to this connection method is that you can't use the Atari Arcade with an iPad in landscape orientation, making games such as Pong a little awkward, if not impossible. 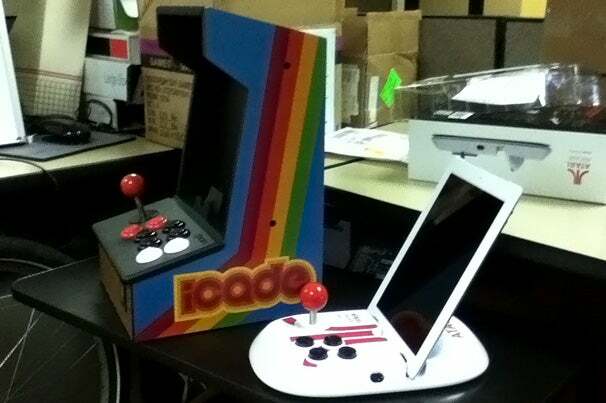 The iCade and the Atari Arcade side-by-side. Though smaller than the iCade, the Atari Arcade isn't quite small enough to be portable. The feel of the controls is also very different. For one, the Atari Arcade has only four buttons, but those buttons also lack the old-school, concave surface that adds so much authenticity to the iCade. The joystick on the Arcade is also a little more difficult to use—which, because the Arcade is so much smaller and less sturdy, means that a vigorous nudge of the joystick can end up moving not just your onscreen alter ego, but the entire Arcade, as well. At $60, the Atari Arcade is a little easier on the wallet than the iCade, and the Arcade's easy set up makes it a fun choice, but its lack of compatibility with non-Atari and non-portrait-orientation apps and poor joystick control make the big price difference less appealing. If it had charging capabilities, the Atari Arcade could make up for its mediocre performance and features by bridging the gap between novelty accessory and indispensable office ornament, acting as both a stand and a fun, decorative console. But in the end, it feels too limited. This story, "The iCade and Atari Arcade bring old-school gaming to the iPad" was originally published by Macworld.